But I thought that's what everyone was using to look at photo albums these days. I seem to recall someone saying that, right here in these forums. He was convinced that no one was using large desktop monitors for anything any longer, and that designing things to look good on big displays was pointless. ...now it looks Ok even on a Phone in portrait mode, see enclosed screenshot. Looks much the same on Android (ss). But you actually think that looks OK? Really? He was convinced that no one was using large desktop monitors for anything any longer, and that designing things to look good on big displays was pointless. Nonsense, I never said that! I only said that the mobile platform will become much more important as the PC platform, so jAlbum should concentrate develeopments for that type of devices, see here. In my opinion anything bigger than 300x300px shouldn't be put in an IFRAME, anymore. Google also shares this opinion as far as I know, and their SERPS engine (search engine rankings position) takes iframes into account too. It was simply a wrong idea, that could make sense in the time when the average monitor size got bigger every year, but not today. 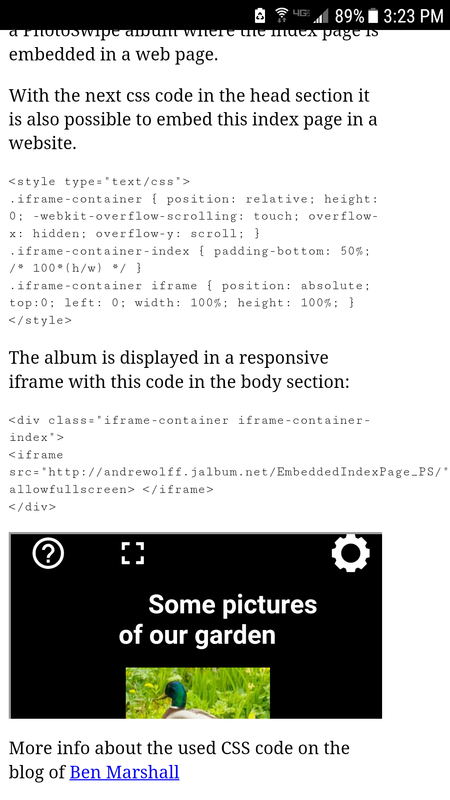 I tried "responsive embedding" too, but that didn't took device orientation into account. So no way of getting rid of those usability issues introduced by embedding a user interface into another.